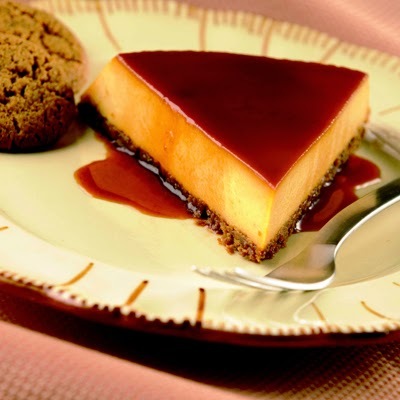 Food That Rocks: Pumpkin Flan With Gingersnap Crust, Oh My! Pumpkin Flan With Gingersnap Crust, Oh My! A Latin Classic With a Touch of Fall! PLACE sugar in small, heavy-duty saucepan. Heat over medium heat, stirring frequently, for 10 minutes or until melted and caramel in color. Quickly pour into 9- or 10-inch deep-dish pie plate; swirl around bottom and side to coat. PLACE sweetened condensed milk, evaporated milk, pumpkin and eggs in blender; cover. Blend until smooth. Pour over caramel (pie plate will be very full). Place pie plate in large roasting pan; fill pan with water to 3/4-inch depth. Carefully place in oven. BAKE for 40 to 45 minutes or until knife inserted near center comes out almost clean. Remove flan from water; place on wire rack to cool completely. COMBINE gingersnap crumbs and butter in medium bowl; pack mixture onto cooled flan (the gingersnap mixture should not be made in advance). Refrigerate for several hours or overnight. To serve, run knife around edge of dish. Invert serving plate over dish. Turn over; shake gently to release.